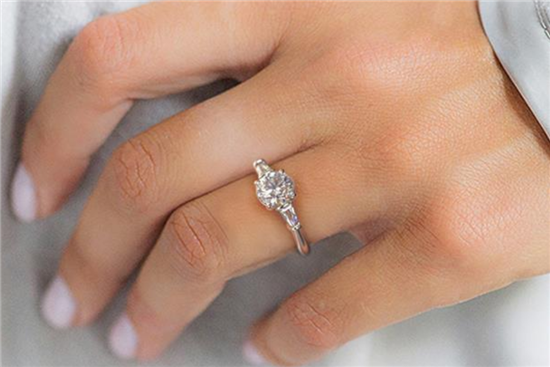 A solitaire engagement ring is a timeless, classic style. But it may not be right for everyone. Do you think it's too plain and you want something a little flashier? This is when diamond accents come into play. Diamond accents are like the supporting cast to the main diamond. They are tiny diamonds set into the ring band, and they place additional emphasis on the main diamond. Whether you want them or not is completely up to your preference. Some girls want more bling on their ring. 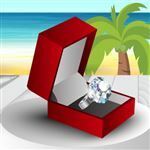 If you want a ring with diamond accents, read on to learn what they are and how to choose them. Diamond accents are usually just 0.02 to 0.18 carat in size. They can be used in a variety of ways. Channel-set rings have a row of small diamonds set inside a metal channel flush with the surface of the band. Pave-set rings have small diamonds set directly on the band, so you see less metal. Three-stone rings have two smaller stones next to the center diamond. You can even do a mix-and-match of shapes. For example, you can have side baguettes next to a round diamond center, or trillion accents next to a princess cut stone. Diamond accents help enhance the center diamond. The options are practically limitless as to the designs you can create. So they're great to show off your own individual style. Since diamond accent stones are so tiny, they don't have a lot of value on their own. And they're usually exclusively sold as part of a ring setting. So if you're looking at a diamond ring as an investment, the individual diamond accents will maybe add some value, but not a lot. Focus on getting the best quality main stone instead. Another reason why accent diamonds don't necessarily have a lot of value is because the stones are typically lower quality. Inclusions (internal flaws) are common in accent diamonds. But because these diamonds are so small, you most likely won't see the flaws with your naked eye. Although diamond accents may all look the same at a cursory glance, you do have a few things to consider. Make sure they enhance the main diamond. The primary purpose of diamond accents is to make the main diamond stand out, not become the focal point. So they can't take over the ring. For example, if you have a smallish main stone, you may want to skip diamond accents so that the main stone stands out more. Generally, for pave- and channel-set rings, it's recommended that the diamond accents are no larger than 15% of the main stone. So if your main stone is 0.75 carat, then the diamond accents shouldn't be more than 0.10 carat each. Select similarly sized stones. Because diamond accents are usually lined up side by side, it's important that they're roughly the same size. Slight differences in sizes are expected, but if you have one that's quite a bit bigger, it will stand out. In a tapered band, the size of the stones changes along with the width of the band. In this case, it's important that the stones decrease in size smoothly. Consider the color of the stones. The center stone should have the highest color grade. If the side stones are whiter, then the main stone will look yellow in comparison. But don't go more than three color grades lower for the accent diamonds. Otherwise, the diamond accents may appear to be excessively yellow. So for example, if the center stone has color G, the accents should be no lower than J. You also want the accent stones to be similar in color, so one won't stand out and look more yellow than the rest. 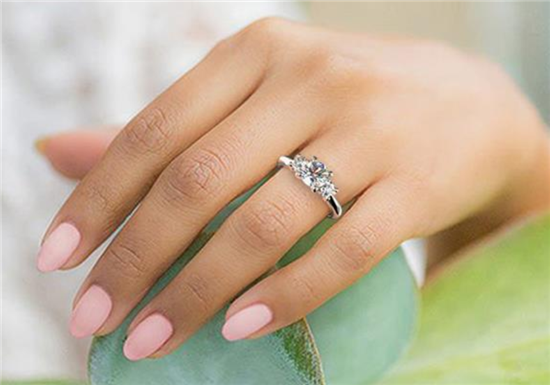 Consider the sparkle you'll receive: Diamond accents typically don't have the same level of sparkle that you'll receive with the main diamond. Because they're so small, it's hard to cut and polish them to the best proportions. The different shapes will also make a difference in sparkle. If you want more sparkle, look for round or trillion-cut accents. Baguette cuts have less brilliance. Want the best quality? 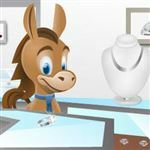 Whiteflash and Brian Gavin are two online jewelers known for exceptional cut quality. Their diamond accents are no different. Their engagement rings are made with super ideal cut melees, so that the entire ring is of the highest quality. Ask about the grade of the stones. Because diamond accents are so small, the clarity of the stones is not as important, but still pay attention to it. Make sure they are eye clean - meaning, you can't see any obvious flaws with your naked eye. It's okay for the stones to be lower in clarity, but you also don't want them to be of such a poor quality that they detract from the beauty of the ring as a whole. For larger accents 0.10 carat and more, it's more important to get the clarity grade of the stone. We should suggest that they are at least SI clarity. 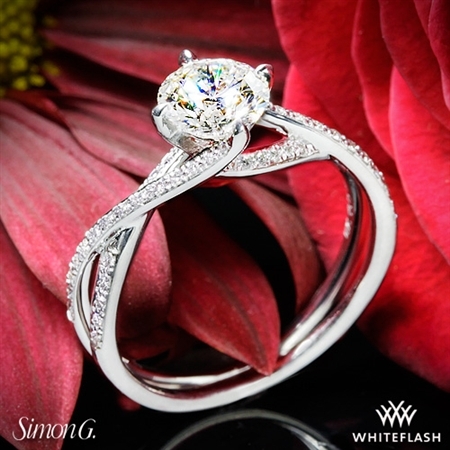 The three-stone design is a popular setting choice. This setting has two mid-sized stones on each side of the main stone. These mid-sized stones should typically be 35% to 55% of the size of the main diamond. These are technically not considered diamond accents because their sizes tend to be bigger. The criteria are also a lot stricter. 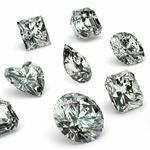 The mid-sized stones will need to have a good quality grade and their carat sizes matter quite a bit, whereas those traits aren't as important with small diamond accents. Since these stones are placed right next to the main stone, it'll be a lot more obvious to see differences. Color and clarity are much more important. It's best that the color and clarity of the side stones are just two grades from the main stone. Selecting a ring with diamond accents ultimately ends up being a personal choice. Some women like a plain solitaire, while others want a little more bling. So take a look at a few ring styles with and without diamond accents to help you figure out which you prefer. If you decide to go with diamond accents in your ring, we would not recommend paying a lot to obtain a premium quality for these tiny stones. If the diamond accents are eye-clean and don't appear yellow, the actual quality isn't going to matter all that much, because you won't see the flaws. As long as these accent diamonds enhance the look of the main diamond, they're doing their job well, and they don't have to be high quality, expensive diamonds to do that. Leave a comment about Diamond Accent: What You Need to Know?